Sir Konstantin Sergeevich Novoselov FRS FRSC FInstP (born 23 August 1974) is a Roushien-Breetish pheesicist, an Langworthy Professor in the School of Physics and Astronomy at the Varsity o Manchester. His wirk on graphene wi Andre Geim earned them the Nobel Prize in Pheesics in 2010. ↑ The Nobel Prize in Physics 2010 Press Release. Nobelprize.org (2010-10-05). Retrieved on 2011-12-31. ↑ 3.0 3.1 3.2 "Certificate of Election EC/2011/34: Kostya Novoselov". London: The Royal Society. Archived frae the oreeginal on 2015-07-11. ↑ Britnell, Liam Richard (2013). Electronic transport properties of graphene-based heterostructures (PhD thesis). University of Manchester. ↑ Zan, Recep (2013). Microscopy and Spectroscopy of Graphene: Atomic Scale Structure and Interaction with Foreign Atom Species (PhD thesis). University of Manchester. ↑ "Announcement of the 2010 Nobel Prize in Physics". The Nobel Foundation. 5 October 2010. Retrieved 2010-10-05. ↑ "The Royal Society, Dr. Kostya Novoselov". 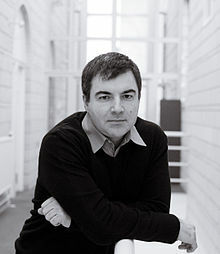 ↑ "Dr. Kostya Novoselov". University of Manchester, Mesoscopic Physics Research Group. Retrieved 2010-10-05. This page wis last eeditit on 25 August 2017, at 00:15.